Aldos Othran is a Dunmer farmer living a very hard life in Cheydinhal. After the tragic and unexpected death of his wife, he turned to alcoholism, and his many drunken exploits around town gave him fine after fine by the corrupt City Watch, more specifically the captain of the guard, Ulrich Leland. As Aldos couldn't afford to pay the fines, he got kicked out of his own house and now lives on a bedroll behind Riverview, where he gets by consuming mead and strolling around town, singing old songs in a drunken stupor. During the related quest, he will meet his demise at the hands of the guard in front of his house, an event that will finally put a stop to Ulrich's evil ways. He sleeps on his bedroll every night until 10am and immediately starts drinking when he wakes up. After two hours, he heads for the two bridges connecting the small island in the middle of town. He can be found on the bridge closest to Riverview from midday to 4pm and on the other bridge from 4pm until 8pm, constantly singing the "Cliff Racer Song" to everyone who passes by: "Flyyyin'... flyyin' in the skyyyy.... cliff racer flys [sic] so high.... flyinnn'..." After that, he will return to his bedroll for yet another four hours of drinking before finally going to bed at midnight. The exception to this schedule is during the related quest, when he will walk directly to his house, and argue and insult the guard who watches over it before finally engaging in combat with him. He is armed with an iron dagger and carries around his mug and a very small amount of gold. He wears breeches, oiled linen shoes, and a shirt with suspenders. The only thing you can get out of him when you approach him is a drunken, "Who... wha... are you... time is it? Hic." Llevana Nedaren is obviously very worried about him and will tell you the full story: "Take my good friend Aldos Othran for example. In the last month, he's been fined six times! SIX! All for being drunk and disorderly. Have you ever gone past a guard barracks? When are they NOT drunk and disorderly? What kind of a stupid fine is that? Well, Aldos couldn't pay his last two fines, so they seized his home and threw him into the street until he could pay it! Bastards! Poor fellow. You may be able to find him roaming the streets of Cheydinhal, probably drunk. Only a month ago, he lost his wife. They were traveling the road from the Imperial City when a bandit raiding party struck. He barely escaped alive. Ever since then, he's been drunk. Sure, he gets rowdy sometimes, but he's never hurt anyone." After being asked to see him by Garrus Darelliun and when standing near him, Aldos may say, "Wha'? You say somethin'?" If you speak to him, he will ask, "Who're you…?" Questioning him about Ulrich Leland results in, "Ha! That stupid swi't! Throw me out of my home, will he? I'll show him a thing or two about messing with an Othran! All I did was fall down, sure. Maybe even vomited on the floor of the tavern. Charge me six times, Ulrich… charge me you fetcher??! Well, I'm not standin' for this any more. You come with me and I'll show you what the Othrans can do when their backs are to the wall." He will then lead you to his house. If you speak with him while he is leading you there, he will brush you aside: "Get outta my way, and keep followin'. I'll show ya a thing or two…" Upon reaching his home, a conversation follows between him and the guard there. Aldos Othran: "This is my house! Get out of the way… move, I say!" Cheydinhal Guard: "Sir, this property has been seized by his lordship, the Count of Cheydinhal. Leave immediately." Aldos: "I said move! Or by my ancestors I'll put you on the ground with a split lip!" Guard: "Sir, I must warn you that threatening a city guardsman is an offense punishable by a fine of no less than 50 gold. Pay or be jailed." Aldos: "You s'wit! How dare you! Ulrich be damned! He can take his fine and stuff it up his backside!" Guard: "You've been warned. You are now under arrest. Please, come with me." Aldos Othran will then retaliate: "I'll go nowhere with you, fetcher! Nowhere!" He will then initiate combat with the guard, quickly resulting in his death. Once the inevitable has happened, Llevana will of course be shocked to hear the news: "Oh no! They killed him! I can't believe this! Ever since his wife passed at the hands of the bandits, his life has been miserable. I'd grown to become fond of him. I wanted to take him into my house, but I was afraid. And now look what's become of him." She'll conclude with, "I'll make the necessary arrangements for his burial. He'll be buried next to his poor wife." Garrus will also be disappointed: "Damn. I was afraid this might happen. Poor Dunmer. Please, go tell Llevana the sad news. I must ponder the situation." Aldos' death will drive him however to end Ulrich's taxes in a more lawful way than Llevana: "Aldos will be mourned. I won't sit by and watch the innocent being driven to the brink like that. Something must be done, but without bloodshed." 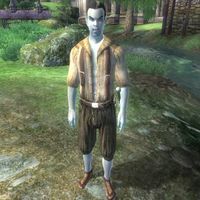 He and the necromancer Noveni share the same surname, although there does not appear to be any in-game relationship between the two. This page was last modified on 27 September 2018, at 10:34.